• Q: reserved for future purposes. Letters I and O have not been utilized. The Sections can ask to the A.R.I. the issue of a Special ASC (aka SASC) for special events regarding the territory where the Section is, or for recurrences or anniversaries. The A.R.I. issues a SASC for a limited time, defined by the Responsible of the Section (usually the President). Same chance is given to the Groups owning a proper “IQ” Callsign associated to the A.R.I..
Each SASC will be released once, must start with the letter identifying the Region where the applying Section is, and must be different than normal ASC’s . Italian Antarctic Bases have two ordinary ASC: The Base “Mario Zucchelli” II0MZ has ASC-Z01, and the Italo-French Antarctic Base “Concordia” has the ASC-Z02. ASC and SASC can be added to get the complexive number of ASC’s valid to request the Award and their upgrades. 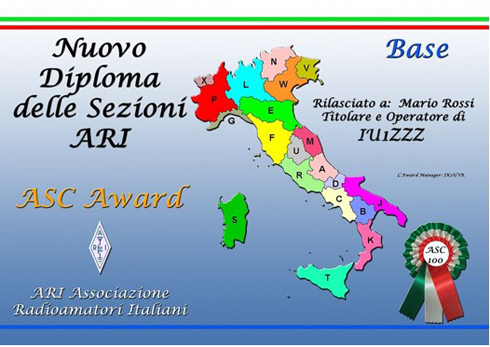 This Award is based on paper QSL card only. Either E-QSL or LoTW or similar tools are void. The QSL cards must be in possession of the applicant even they don’t have to be sent to apply for ASC Award. Anyway the Manager can request some scan of them to verify what declared. 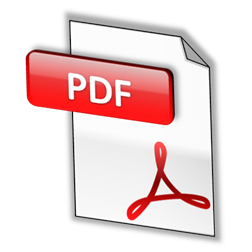 The Award and its endorsements are free and they will be sent to the applicants as PDF files. We neither print the Awards nor send them via surface mail. 1) We are proud to introduce the New ARI Sections Award or ASC Award. 3) Purpose: collecting Ordinary ASC and Special ASC (SASC) through QSOs/HRDs with Amateur Stations members of A.R.I. of A.R.I. Clubstations or any other Clubstation member of A.R.I. operating from the Italian territory with the exception reported in the Art. 5. 4) Ordinary ASC: ASC means A.R.I. Section Code. it is composed by one letter and two numbers and identifies the local branches of the A.R.I. present on the Italian territory. 5) Special ASC (SASC): A Special ASC (SASC) has a different structure than an ASC but it first letter recalls the Region where it has been issued. The SASC is issued by the A.R.I. National Award Manager to Section or Groups in possession of a callsign whose prefix is IQ, members of a Section of the A.R.I., as a result of an application to celebrate special events and it has a limited duration. SASC can be issued also to Stations operating with a special callsign (prefixes: II, IO, IP and IR) as Special Event Stations (no Contests! ), and to Italian stations temporarily operating outside Italy for institutional, military or scientific reasons (e.g scientific stations, polar stations, peacekeeping missions). SASCs are not elegible for QSY for work or holidays. Applications for must be done with proper forms “Allegato 1” or “Allegato 2”. 6) Validity of the QSO/HRD: all QSOs/HRDs with Italian Stations operating from the Italian territory by members of the A.R.I. are valid. QSOs/HRDs with Italian stations operating outside Italy for institutional, military or scientific reasons with SASC are valid. 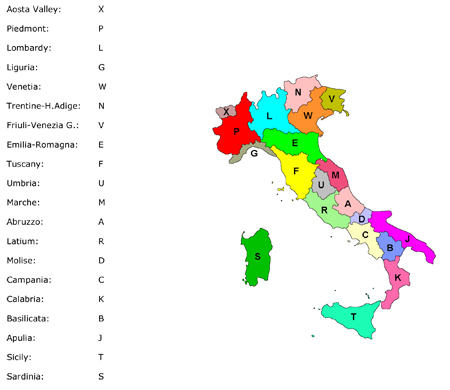 Contacts or HRDs with Italian Staions operating with Special Callsigns issued for Contests (in this case only ordinary ASC) or Special Event Stations (prefxes: II, IO, IP e IR – ASC or SASC) are also valid under the condition that is possible to identify the A.R.I. Section of the Operator that is using the Special Callsign, or in case the S.E.S. is giving a SASC. Stations with prefix IY (Marconian Stations) can only give Special ASC. 7) Start: All QSOs/HRDs made on or after January 1st, 2013 are valid. 8) Bands and modes: All HAM bands and all modes are valid. Contacts/HRDs made via terrestrial repeaters and Internet (VoIP) are not valid. Contacts/HRDs made via satellite/EME are valid. All QSOs/HRDs must be confirmed through paper QSL. E-QSL and confirmations in log-on-line like LoTW are not valid. 10) Upgrades: each 50 ASC/SASC after first 100 ones it is possible to apply for a new Award (ASC-150, ASC-200, ASC-250). Over 250 ASC/SASC the steps can be 10 ASC/SASC. Over 300 ASC/SASC the upgrades can be just one ASC/SASC (just for classifications). An upgrade can be requested to the Manager not before 3 months from the previous one. 14) To get the ASC: to help to get the ASC in case the QSL does not report it, a proper search engine will be implemented in the A.R.I. Web site www.ari.it . This system will provide the Code year by year (as members can change Section). Year means solar year unregarding the movements in that year. E.g. if a member moves from Section X to Section Y in October 2013, he will use the Code of Section X until December 31st 2013, and the Code of the Section Y from January 1st 2014. 15) Endorsements: the Base Award is Mixed (all bands/all modes). After to have obtained the Base Award, it will be possible to apply for different Awards, that can be Single Band all modes, or Single Mode all bands. All modes are valid but the endorsements will be only for PHONE (SSB/AM/FM), CW, DIGITAL (all Digimodes) and SATELLITE (including EME); the endorsements by Band will be for 160m, 80m, 40m, 30m, 20m, 17m, 15m, 12m, 10m, 6m and 2m. 16) Fee: all awards are free and they will be sent to the applicants as PDF via e-mail only. 17) Classifications: they will be published on the magazine “Radio Rivista” and on www.ari.it .